Our premium in-house cocoa blend is made of the finest ingredients and flavors, from the Thrive Instant Milk and dash of coconut water that create the creamy texture to the hint of our Pure Vanilla Powder that makes for irresistible flavor. With no artificial colors or flavors, you're tasting the pure goodness of hot cocoa as it was meant to be. Cane Sugar, Sweet Whey, Instant Nonfat Dry Milk (Nonfat Milk Solids, Vitamin A Palmitate, Vitamin D3), Cocoa (Processed with Alkali), Freeze-Dried Coconut Water Concentrate, Tapicoa Dextrin, Vanilla Extract Powder (Vanilla Bean Extractives, Sugar, Corn Starch, Tricalcium Phosphate, Glycerine), Salt, Cellulose Gum, Guar Gum, Natural Flavor. 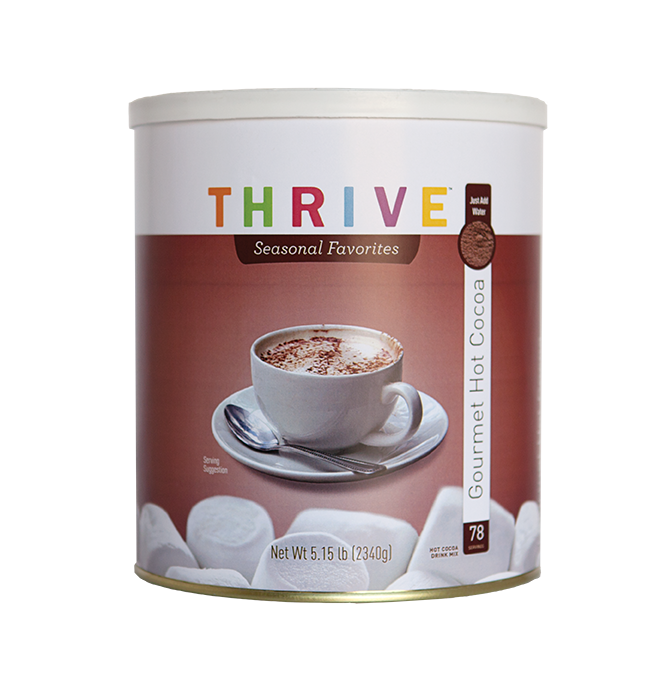 Add 3/4 cup hot water to 2 1/2 tablespoons of THRIVE Gourmet Hot Cocoa and stir.